A couple of weeks ago, I told you all about my favorite crochet tools and why having the right equipment is important. 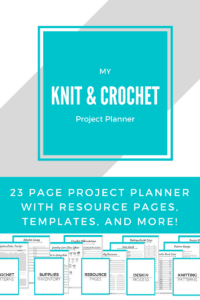 In that post, I shared the top 5 things I use when crocheting and why I love each product. This week, I wanted to talk a little bit about my knitting tools. As with crochet, there are only a few knitting tools that you really need, but sometimes it can feel overwhelming. So, for now I’m going to put aside all the extra tools and notions and focus on just the few knitting tools that I reach for all the time. Ready? Let’s get started! Disclaimer: This post contains affiliate links to products I use and LOVE. Click here to read my full disclosure. Straight needles are great for working back and forth, but they can’t really be used to work in the round. Unless you also get double-pointed needles. Which seem completely excessive to me. Fixed circulars are better, because you can use them to work in the round, but you can also work back and forth on them for a flat piece. The problem, however, is the you would need to buy a lot of needles in different cable lengths and needle sizes to have a full set. Interchangeable needles are the best of all the options because you can do anything with them: work flat, work in the round, use longer cables, shorter ones, bigger or smaller needle tips. And you only ever need to buy a set once. You can also get additional needle tips or cable lengths if you want, but you most likely don’t need them. I use the Knit Picks Options set in nickel-plated version, but they also come in a few (gorgeous) wood finishes. The set includes needle tips from sizes 4-11, 2 short cables and 2 longer cables, along with a few accessories for attaching the needles and a handy little case. I could talk about these forever and explain how to use them, but I’ll save them for another post if you guys are interested. I bought my set 8 years ago and they are still like new today. I don’t really use stitch markers for crocheting, but I do use them all the time for knitting. They make life so much easier when you don’t have to spend time counting and recounting the number of stitches in a repeat or wondering where the beginning of the round is. I really like locking stitch marker because I can just clip them on where I need them and slip them off when I’m done. I also LOVE the plastic round ones that just slide onto the needle rather than onto the fabric, but I can’t find any links to the ones I bought. Clover brand makes really nice accessories and they have these, but I haven’t tried them so I can’t say for sure if they’re as good. The locking ones, however, are wonderful! I can’t forget about rulers and tape measures when talking about knitting tools. I mentioned this Knit Happy Tape Measure in my post about crochet tools and I love it for knitting as well. It’s just a really good quality tape measure that works. Simple. This Knit Picks ruler, though, is gold. It’s a 6 inch ruler, but I don’t really use it for that aspect of it. What I love is that the ruler side has a magnifying area with 4 inches marked off, perfect for finding the gauge of your work. It makes it so easy to see the number of stitches in those 4 inches. And you see the row of holes on the side? Those are for sizing your needles/needle tips. If you forget what size a needle is, and it’s not written on it, you just stick the tip through the holes to see which one it fits best, and the size is written right there. I love how this ruler is three tools in one and I always have it nearby when I’m knitting! Once you know the basics and are ready to take on interesting textures like cables, you’re going to need cable needles and stitch holders. I’m grouping these together because they both just hold the stitches out of your way when you don’t need them. The first image below is of cable needles in a few sizes and shapes. I like the hook shaped ones more than the straight ones with a dip in the middle because my stitches are less likely to fall off. As for stitch holders, I use these mostly for making gloves. When I need to work on one finger, I slide the rest of the stitches onto these stitch holders and then I can just ignore those until I them. Cable needles are short-term, meant for when you need to move stitches while working one step, then moving those stitches back. Stitch holders close and the stitches can be held for as long you want. These are the stitch holders I like (also in more sizes) and these are the cable needles I use! For this last item on my list of knitting tools, I wasn’t really sure what to include. I had a few options, things I reach for all the time, but I thought I’d choose something super basic and usually overlooked. You need a really good pair of scissors that you only use with your yarn. Don’t use them for other crafts because they don’t stay as sharp and clean afterwards . I just got these at Walmart but I keep them separate. And that’s it! These are the top 5 knitting tools that I think everyone needs, even when you’re just starting out. When I started learning to knit, I invested in the set of interchangeable needles. They were expensive at first, but I use these knitting tools every day and I rely on them to make sure my work is neat, clean, and fun. 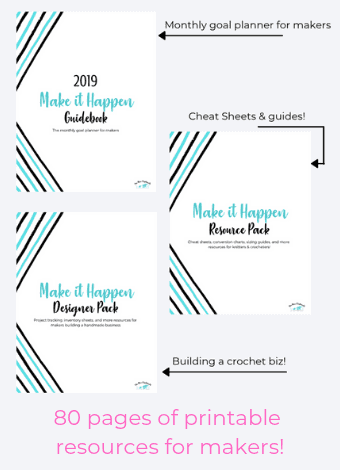 I hope this post helped you figure out what tools you should use and that you enjoyed your peek into my toolkit. I’ll see you guys soon with a new post!